Soak rice over night. Next day drain the rice and spread on a cotton cloth. When the rice is slightly wet grind to fine powder in a mixie. 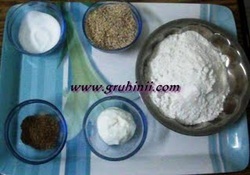 Sieve the flour and take it into a large bowl. To it add salt, butter, sesame seeds and carom seeds. Mix well and make a stiff but smooth dough adding sufficient water. 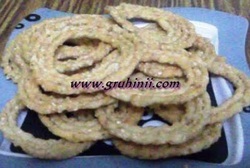 Now take a small lemon size ball of the dough, using your index and thumb fingers and make chakkilalu (like sprial rope) in a circular motion. 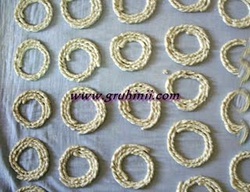 (It may be little hard, but after two or three chakkilalu, it would be easy) Make all the chakkilalu in the same manner and place them on a damp cloth as shown in the picture. Heat oil in a pan for deep fry. 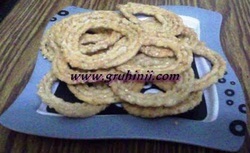 Now deep fry the prepared chakkilalu until golden brown color. Drain on a kitchen paper and store in an air tight container.